And so do we. Barely. Let's get to Hulk Tesar already. 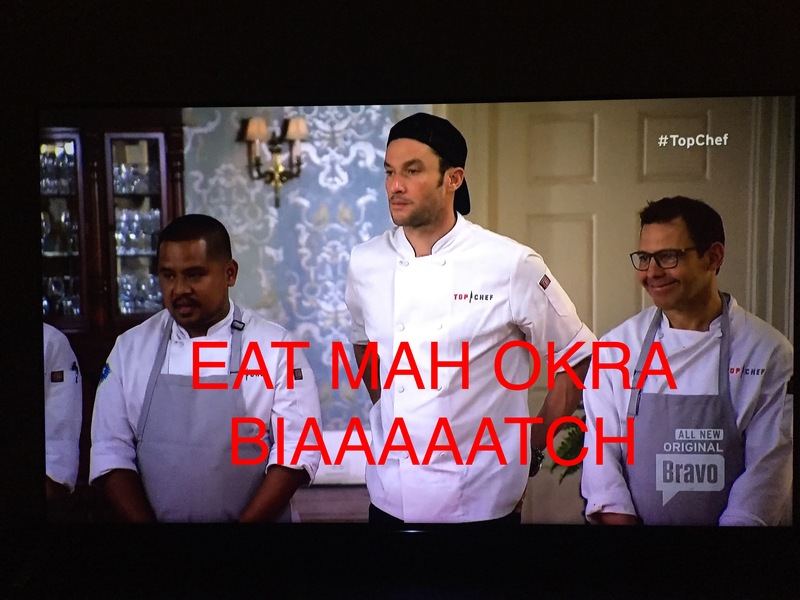 Last week, John Tesar said he was going to be a kinder, gentler Tesar this season on Top Chef. To which, the Reality TV Gods evil-laughed, “Muuuuuuhahahahahahaha,” while they excitedly rubbed their hands together, Mr. Burns-style. Then, there’s the episode where the change of heart sticks around longer than you ever thought possible, so the audience begins to wonder if they are truly witnessing a life change. “Man, I really didn’t trust Anakin Skywalker for a long time, since he’s obviously going to grow up to be Darth Vader. But this sexual chemistry with Padme is off the chain so he must be a good guy. Maybe they’re rewriting his story!” For this episode of Top Chef, there’s a moment where the team challenge has everyone a little on edge, and Tesar calms everyone down. You can’t see it, but a hole the size of Kentucky rips in the fabric of space and time and a completely shocked and confused Danyele McPherson and all the Care Bears are immediately sucked into it. They aren’t even on the show right now. That’s how messed up that was. Even Tesar knew it. “When I become the voice of reason, we all have to start worrying.” One of the other chefs then said, “Hashtag truth.” And I thought that was going to be the moment he broke. “Hashtag SCREW EVERY SINGLE ONE OF YOU. Hashtag SOMETIMES I WONDER IF ANYONE ELSE ON THE PLANET EVEN KNOWS HOW TO PREPARE A BANGIN’ STEAK. Hashtag HEY BRO, WATCH ME MAKE TOM COLICCHIO EAT THIS OKRA WHEN WE ALL KNOW HOW MUCH THAT FOOL HATES OKRA. EAT MY OKRA TOM! EAT IT! !” But, he didn’t break. Just stood there derpy smiling and nice. Kinda made me wonder if there was a secret ingredient in that food beyond okra that he was making Tom eat. I just can’t trust this smile. There’s a longstanding tradition of Tom Colicchio saying he hates okra on Top Chef. So, when Tesar says that’s his dish for this elimination challenge, you’re hoping for a dramatic moment when Tom eats the okra. The editors tee-up the tense music. Tesar looks nervous for the camera. Tom eats the okra. And then, immediately Tom says he likes the okra, ending #okragate before it even started. The best part is, this shouldn’t have even been a dramatic moment at all because, as it turns out, Tom likes Not-Crappy Okra. Tom has talked up his dislike of okra on several seasons, but Tiffany Derry served him okra on Top Chef: All Stars, and he liked it then, too. Maybe the dude just likes the hell out of Dallas Okra. Tesar is still playing nice, but this season is just getting started. And technically, this second episode was just the second half of the premiere episode: there was no QuickFire challenge during this episode. We just went straight into Elimination round giving immunity to last weeks’ QuickFire winners. Point being, he looks nice now, and it’s super fun to listen to his totally normal interviews where he explains how hard it is to be on Top Chef because “We’re all great chefs.” But mark my words: He’s going to eat every one of his competitors. If he pairs any of his dishes with a nice chianti, RUN.